Have you ever woken up with fragments of a dream still drifting in your mind? Then, when you try to reassemble those fragments, you're sure that you're bringing memories into the mix, and things you've seen on TV or social media, or other sources. You can't be sure of what the dream was, or what has been added from other sources, but you know that the combination is something interesting...something that could be awesome if it was refined a bit. I've just woken up from that state and I've had an idea that I just meed to write down before it gets lost. I love the ideas behind the Sabbat in Vampire: the Masquerade. Even more, I love the ideas behind the True Black Hand, and the city of Enoch. So, I really appreciated this. 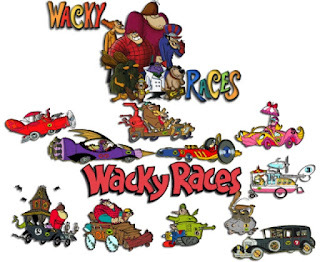 I'd love to run a game, or even write a new game revolving around the ideas in this article. But for the moment I'll just add these thoughts to the primal soup of ideas that I'm always drawing inspiration from. I've had a soft spot for Rifts since I first saw the advertisement hinting at its arrival in a TMNT game book many, many years ago. It was one of those games I really wanted to get into, but almost every experience with it fell flat, and the only time it really started to sing was when we left the Palladium system behind and went freeform. 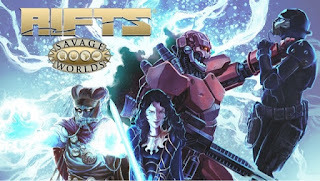 I like the ideas in the Savage Worlds game system, but I'm not sure how good a fit it is for the gonzo inherent in Rifts. I wasn't sure how well the combination of the two would work, but was happy to see a bit of development, and some innovation finally applied to the setting. I certainly didn't expect the project to fund in under two minutes, nor reach the level it's now achieved. It will be interesting to see where things head from here. Digging through my art supplies as I try to complete a suit of LARP armour, I found this guy. 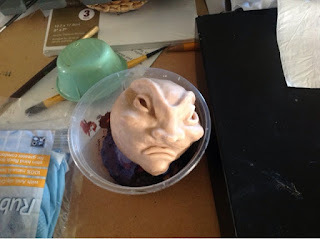 He's got to be at least 4 years old because I remember sculpting him to this level when I was doing the Goblin Tarot. I must get around to finishing him, and giving him a body some day. Maybe he'll be the pilot of a "goblin mecha" cosplay concept I've been thinking about for a few years. That was a surprise...I've just started receiving new orders for The Goblin Tarot. So, I guess that means those people who've been interested in the deck will be able to get a copy of it again some time soon as a new print run is organised. I guess I activated the possibility for orders when I shifted the project to "In Demand" status, so that I could allow people to look at it again. This isn't a bad thing, it's just unexpected. Luckily I have a couple of spare decks in stock. In November of 2014, I was happy that I'd reached 200,000 visitors to the blog. It took me 6 years to reach that level, and I was pretty content with the people who were paying attention to the stuff I had to say. Now in April 2016, I've just passed 400,000. A lot of that increased traffic came from my regular series of reviews last year during Game Chef, and the various other game design contests, and on the whole I'm still pretty content with the number of people who pay attention to what I have to say. I'll probably keep posting half-baked design ideas, keep musing on assorted stuff in a range of topics that meander through the territory of my hobbies, maybe offer a few more tutorial runs. It keeps me from getting depressed, and works as a creative outlet in several ways. Thanks for sticking around everybody. The last crowdfunded project I developed was almost 5 years ago, and now I'm in the process of organising another. Bug Hunt has been giving me a lot of thought recently, particularly regarding costs, value for money, and ensuring I have the funds to actually send the relevant perks to everyone. I've been doing my research, and the $50US price point seems pretty common. My manufacturing costs for the game come in at about two-thirds of that for a one-off POD product, and at the best bulk levels through The Game Crafter (TGC) they come in at about half of that. I've received my prototype from TGC and I'm happy with it. I could possibly get a cheaper product from a certain supplier in China, but I haven't dealt with them before. Sammael, The Desolate One, Lord of the Shadows, Harbinger of Pestilence, Seed of Destruction, Hound of Resurrection. I've been thinking more about the character edges in this game about familiars. What about giving the characters a series of arcane and esoteric titles? Such titles would give hints to the character's special abilities, but are also fairly vague and generalised. I just wrote a massive post, and accidentally hit "delete" instead of "publish". It was a good one too. I tried to do a live unboxing of my prototype, but that didn't quite work out. I was pleasantly surprised at the speed of the box's arrival, just over a week between finalising the imagery and having it arrive at my doorstep. These things are always well packaged, but that's a good thing given the state of some packages I've received in this part of the world. Naturally, the customs inspectors have to make sure anything brought into the house is thoroughly searched and given the "all-clear". On the whole, I'm pretty happy with the way the outside of the package has been presented. Curiously, the automated systems of "The Game Crafter" told me that the game components would be too big to fit in the selected game box, but I actually could have gotten away with a box half the size. The quality of the cards has seen an improvement with the UV coating, compared to the last cards I ordered as a part of the "Town Guard" game. Once again I find myself thinking of options that might be given to players when defining characters. One of the most evocative tabletop roleplaying campaigns I ever participated in did not use character sheets, no dice were ever rolled, there was no table. There were three players, each portraying a character. The game system was vaguely a cross between Amber and Mage. We didn't know our character's stats we didn't know their spheres or arete, we just described what our characters did, or what they attempted to do and based on previous descriptions about our characters we slowly worked out where they were less than average, more than average, or where they might be superhuman (and how far to push things if we knew the limits didn't apply to us in specific areas). I had been thinking about this game from the perspective of street mages, maybe it might be better to play with the concept of familiars to street mages. The reason I've considered this is because I'm not really interested in developing a complex magic system for the game, except as a storytelling effect. Instead I'm thinking that there will be magi who act as conduits reaching from the human side to the mystic energies of the beyond...and there will be familiars who act as conduits from the beyond, reaching toward the mortal realm. Familiars form bonds to magi, each strengthening the link of the other in a symbiotic feedback loop. This helps explain why the characters don't have money, just a limited number of tools and edges. 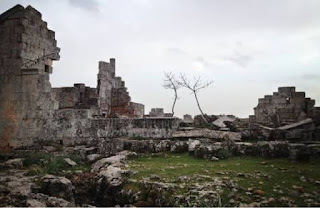 Familiars don't need to improve with experience, but they may gain stronger influence over the world as they establish stronger relationships with the magi, the eternal constants, and other elements of the setting. I had this idea once. The campaign exists in the form of 12 newsheets, or maybe punk-style 'zines. One for each month of the year. It doesn't matter which month you start with, there are news articles, hot bands to look out for, underground happenings, street commentary, and insight into the world. You start with one month, and certain events will be echoed in the next month's 'zine. A single story thread might spread along two, three, four issues. The characters will encounter things that are at their climax, other things that a developing beyond their control, and other situations that are just starting to unfold. Each 'zine would have dozens of such stories, where one event might lead to two or three potential offerings in the next issue, and two of three seemingly unrelated stories might reveal different perspectives or opening into a single large event in the next issue. I've been trying to expand the Rentpunk game in the last post, maybe doubling the word count to 400 words. Trying to make it more coherent and add in a few new ideas, possibly turn this into the game that links in with the landscape images I've been drawing over the last few weeks. Whether this means the game becomes about rentpunk street mages, drawing power from other realities as defined by those lands, or maybe it becomes a game where they go voyaging in those lands as spirit quests to fulfill their obligations to patrons in the mortal realm who are unable to transcend the boundaries of our space and time. Once again, I find myself with fragments of ideas, but nothing altogether coherent. Maybe I need to sleep on it. 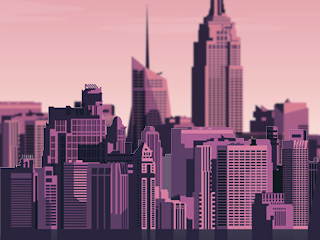 A new 200 word RPG for urban fantasy magi on the down low. 2x Goal Sheet What do you want? (edge/equipment gained) What’s stopping you? 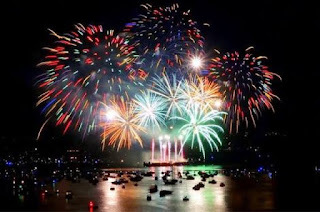 (accumulate 3 successes/marks before attempt to claim it) If complete, write new goal. 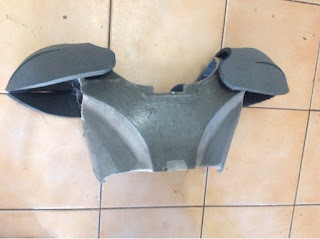 I wonder if anyone is interested in a step-by-step tutorial series about making foam and fibreglass LARP armour. It'd be a week or two away, because I need to buy some more fibreglassing supplies. Bug Hunt has been sent for proofing. Roughly $35 manufacturing cost, roughly $40 to get it sent from the US to my place in Australia. I really wanted to get the game ready as a Kickstarter or Indiegogo project, but with those costs and the way the Australian dollar is going at the moment, that works out to $100 a game in this part of the world. I'm looking at maybe running with a $50 retail for the game, with free shipping to the US. Then adding an extra $20 for shipping to Australia, which hopefully means I'll break even on the games shipped to Australia. I'm told shipping inside the US will cost $6-10, so I'll make a little bit of profit on those games. I'm doing a university assignment on educational diversity, and the specific troubles certain groups face in the world. I'm using my Bug Hunt game as the framework for this project, since I know it works, and it has a solid educational basis with three distinct levels of play for different player types (novice, intermediate, expert). The new Southern Highlands LARP Game has a name. It is called Nexus, and the organiser has released a rule set and character generation system for it. All in all it's pretty similar to what we've been seeing in a lot of the LARPs through this part of the world. This is basically because a group of guys wrote the original set of rules that everyone has spun away from. I've discussed this previously (and as a follow up to that post, the last Elgardt Game we ran had a total of 2 people showing up...me the Storyteller/GM, and the Venue Co-ordinator). There's a few interesting concepts in the rules that have been considered taboo in many of the other local games, like the potential for permanent character death if you aren't careful. There's a few other things that personally I'd be changing, but at the moment I'm happy for there to be another game to go along to. A bit of playtesting and we'll see how things go. I worked out what I was trying to remember as I was cooking home made hamburgers with havarti cheese, pineapple, bacon, mustard, rocket, home made salsa and home grown tomatoes. I was reading Andrew Knapp's Tales of the Scarecrow review a couple of days ago, and thought that this seemed like one of the things I do quite often in my games. I haven't specifically read the module reviewed, but I'm probably going to buy a copy of it at some stage. What I have done though, is try to formulate a 200 word supplement that captures the essence of how I'd introduce this kind of concept into a game. You could possible use it a game unto itself, but it's really more of an exercise for injecting flavour and character into a locale that the characters are passing through. I've written the first draft of 200 words. There might be another draft before the concept is submitted as my official "supplement" entry into the challenge. Nope. I opened up the blog to write something that had been festering away at the back of my mind a couple of hours ago...and I just can't remember what it was now that I've got a few minutes to start typing. There might be another post in a couple of hours if I can think of it then. Like I said at the start of the month, it's that time of year again... Competition season. 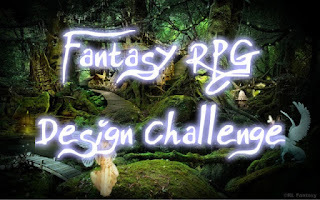 The Fantasy RPG Design Challenge will expand this year. The goal: Spur the creation of fantasy RPGs that avoid fantasy tropes. Designers will have to avoid both fluff tropes (elves, dwarves, magic swords, etc.) and mechanical tropes. To that end, I will post increasingly difficult challenges every couple of months. The next challenge, which I will launch in 2 weeks, will add to the list of fluff tropes by requiring a default setting other than something similar to Medieval Europe. That's not the only change, either. Later challenges will target D&D-style mechanics. I have ideas for even more interesting challenges than that later on. So find your design hat and start thinking! Yes, it's a bit of a "click-baity" title, but it's something I've been thinking about lately, and this whole "White Male Gamers as Terrorists" thing has fed into that (The article and the issues around it have been addressed by Wyrd). The problem is that I've seen a lot of people point the blame at Wyrd, but have seen far worse offences and atrocities commited by Games Workshop. I'm not saying that the volunteer representatives of Wyrd (or employees, depending on whom you ask) get a free pass because Games Workshop does it worse. 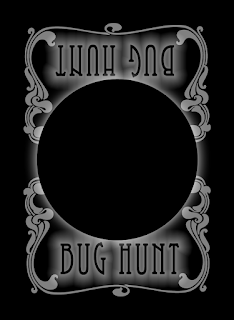 We're getting closer to a formal launch for Bug Hunt. ...a few more tweaks and it should be ready to go. It comes in at 200 words, but there are symbols in the text that simply won't work for the 200 Word RPG Challenge, because the challenge states that entries need to be submitted in plain text. So it's currently sitting in a state that is too formatted for the challenge, but not formatted enough for me to be happy releasing it as a formal game product. I want to add a few more manga/anime-styled pictures to it, describing characters journeying across a desolate landscape, or toward a high-tech city. The 200 Word RPG Challenge for 2016 has started, and already entries are starting to trickle in. I might review a few of these, depending on how I go for time. I've started working on a concept that I'm calling "The Journey" at the moment, it's current bang on 200 words and I'm working on some layout for it because the last game design contest entry I offered (for the Threeforged challenge last year) really suffered due to a lack of attention in this regard. Give me a couple of days and I should have something pretty on offer. 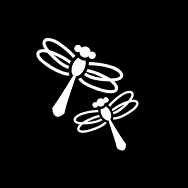 One of my long suffering backburner projects has been "Bug Hunt", a little game about kids chasing insects and other bugs in a swamp. It's been a fun little game involving a bit of luck, a bit of strategy and a bit of double dealing. I've just spent the last few hours working on cards for the game and rewriting the rules according to the playtest updates it's seen over the past year. It's going to form the cornerstone for a university assignment I've been working on with a group of other students (I hate group work, but they're letting me take the lead on this one). The thing about this particular University project is that it's for a subject about diversity and social injustice. I need to create a game that is inherently unbalanced so that players can see what it's like to be in a situation where things just aren't fair. The 200 word RPG challenge is just around the corner, and that means the start of the game design contest season. I managed to churn out quite a bit last year, as well as peruse some awesome design work by dozens of other game creators. I'm thinking that this year Imight try to design a 200 word Boffer LARP. That should be interesting.